Un mod semplice,tratto in parte dalla realtà ed in parte dalla fantasia,ma sostanzialmente ispirato ai camion che corrono la Parigi Dakar. Per ottenere un buon effetto clacson tenete premuto il relativo bottone. I team Horrorace e River hanno un clacson speciale. Nessuno può modificare in tutto od in parte il presente mod senza la mia esplicita autorizzazione. 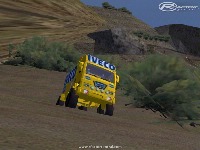 A simple model, drawn in part from the reality and part fantasy, but largely follows the truck running the Paris Dakar. To obtain a good effect on the horns hold the relative button. The teams Horrorace and River have a special horn. No one can change all or part of this mod without my permission. There are currently no setups for RallyTruck. Add a Setup. 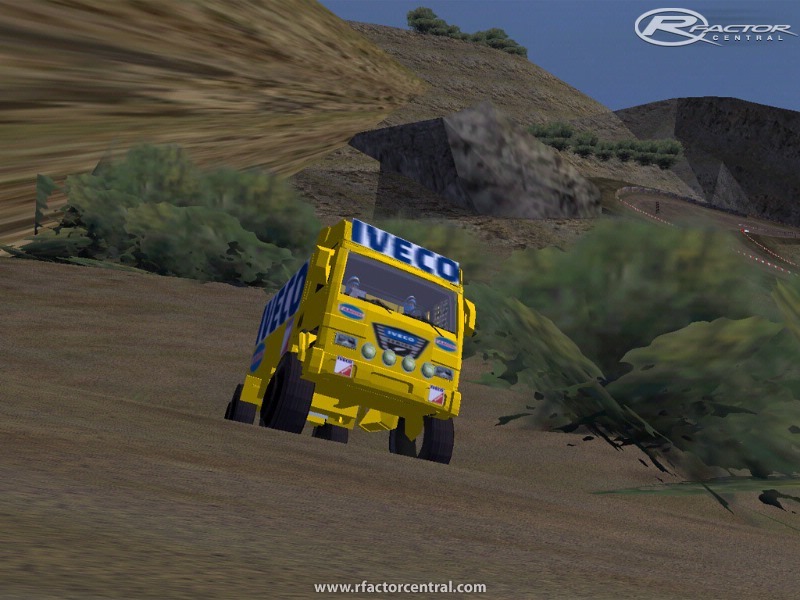 There are currently no car skins available for RallyTruck. If you are a painter you can share skins for this mod via the Car Skins area. Visit the Spray Booth for painting tips & tricks. This is good mod apart form the fact that the brakes are awful and the tyres do not look realistic also the handling needs work but sort out the brake because:camera you have to brake 500 meters form corners + on the hand the top speed is brilliant over 200! Scratch? Looks familiar for some reaason!! No offense, do not worry about it.I know little about creations,and i use 3d max only with help of some tutorials that I find on the net. Despite everything I still wanted to try my hand in creating mods. It is like those who try to paint a picture, but the picture will never be perfect like a true artist,but appreciate the willingness and commitment. With my mods i launching an idea, original if possible, and I hope that someone much more good can then create a masterpiece. Hi Luca, I apologise if I've caused any offence. It's frustrating when there seems to be a case of quantity over quality when it comes to mods. I'm sure you'll agree that the best mods out there are the ones with lots of time and effort spent on them and worked on by a collabarative team of guys all lending their varied expertise. I didn't consider for a moment that you were going it alone with this one, nor did I consider that it was your first mod. Like i said in my last comment, I applaud you for what is potentially a great contribution and I hope some people out there take you up on your request for assistance. If I can be of any help don't hesitate to ask. Dear Kazuo, I'm not very experienced in creating mods. I know that my work is not without flaws, not have the time needed to correct any problems. As you said this is the best I can do, i'm alone on creation(no team)and i just create everything myself. I therefore found it necessary however to provide my work to community, which can improve or change it. Obviously no one is forced to download and use anything unless it is to his liking. Well yes and no. I think there are a lot of mods that are rushed out before they're ready. If this is truly the best this guy/team can do then I apologise and I applaud them for taking the time to contribute something. However if it's a slap dash effort put out just to be the firstofit's kind then it's wasteful. It's a good idea for a mod, but the execution is not as good as it could be. Horrendous, absolutely horrendous. Don't waste your time downloading.